French style scrambled eggs, "Oeufs Brouilles" meaning curdled eggs, similar to scrambled eggs but done in a double boiler with care taken to avoid setting the eggs too firm. The result is similar to the yolk of a very soft poached egg, and is wonderful at carrying the truffle flavour to the tongue. It is well worth the extra effort. Caviar (optional) "Oeufs brouillés à la truffe noire, au caviar", has a nice sound to it. 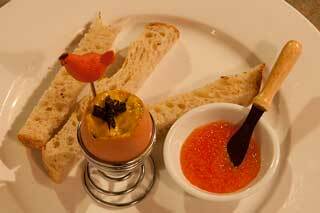 "Black truffle scrambled eggs, with caviar." Break eggs (or cut ends off, see below) into a bowl, whisk thoroughly. In a double boiler "bain marie*" melt the butter and add the egg mixture. Stir constantly until the eggs are thick and creamy (about ten minutes). The egg will cling to the spoon, but thin a little when the cream is added. Do not let them set too firm. If truffled eggs set firm the flavour impact is reduced by about half. Remove from heat, continue stirring while adding the cream. Season to taste with salt. Sufficient salt is very important for tasting truffle fully, so start with a generous pinch. Caviar seems best as a side serve, on the same fork, the caviar tastes 3 times stronger, the truffle flavour is hidden. For a more dramatic presentation, cut pointed ends off eggs and clean under tap, dry. Use them as serving vessel in an egg cup for the truffled egg mixture. Garnish top with a truffle slice or caviar. Serve with fingers of toast. *Bain marie -is a designed double boiler, however a small saucepan inside a larger one works for double boiling. For eggs, don't actually boil the water as it tends to set the egg faster than you can stir. It's better to take to nearly a simmer temp, and then set flame low for quiet simmering.